Assam Board of Secondary Education (SEBA) declares the final exam time table for 10th Class Exam 2014 – HSLC (High School Leaving Certificate) Exam and AHM (Assam High Madrassa) Exam 2014 to be held in the month of March 2014. All the students of Assam Board waiting for the 10th class board exam schedule including exam dates and time of the examination, can download the complete schedule online through the official website of the education board www.seba.net.in. According to the final exam schedule released by SEBA, Assam board 10th class exam 2014 will starts from 13 February, 2014 and ends on 6 March, 2014. All the students are advised to start the exam preparation according the schedule released. You can also download the complete document published by the Assam board of secondary education on its official website www.seba.net.in. 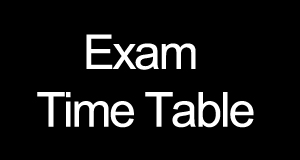 Click on the following link to download the exam time table 2014.